Within a couple weeks of news revealing that women recruits had failed to meet Marine combat standards at an alarming 86 percent rate the Marine leadership has revealed that it will remove ‘man’ from 19 job titles to make the tiny percentage of women who can actually fill these roles more comfortable. This is just another example of the political correctness in this country that has now gone to a level of insanity. Will we now call firemen – “fire persons” or policemen “police persons”? Even the news of women failing to meet new combat standards was attempted to be softened. Let’s be clear. There have always been men that have not met the high standards of the Marines. 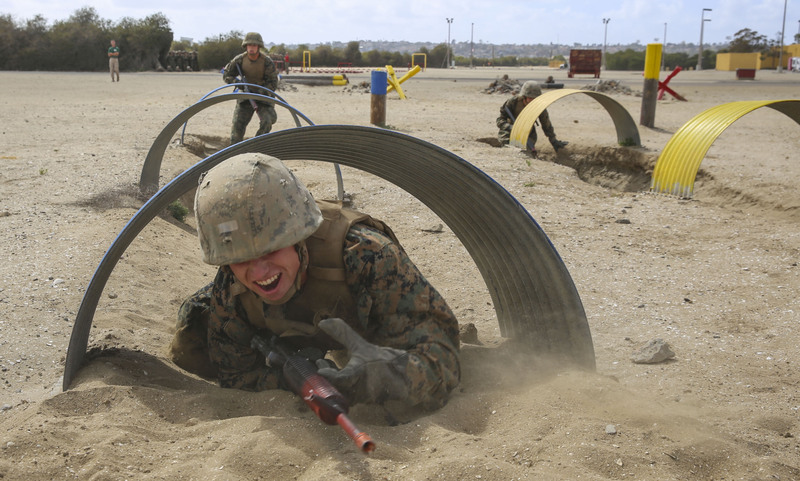 But there is absolutely NO comparison between 3 percent of men not meeting Marine combat standards and 86% percent of women not meeting Marine combat standards. These numbers emphasize a truth that a small child could tell you. Women are not made for combat and women in general cannot compete with men in the physical arena. This is why we have separate sports for men and women. Sorry ladies – when we go to war they don’t have a separate “boys’ team” and “girls’ team”. When will we as a people stand up to this political correctness that is destroying our nation? When will we take a stand for truth in the midst of these lies that are forced upon us? Some may be offended by “man” in the title of a military position. But you know what folks – you don’t have a Constitutional right to not be offended. We as men, whether it be men in the military or outside the military need to stand firm against this wave of political correctness. Men don’t wallow in the face of women being offended. They stand firm and act like men. They do what is best for their nation, their families and their churches and they do not let feelings get in the way of doing what is right. I pray God will reveal this truth to the next generation of young men. Really wishing my son would have listened to me a bit more before deciding to join the Marines, but he’s stuck now and can’t get out of it. Hoping he will listen to me when I tell him to NEVER EVER get involved with a girl in the military. Swear off women until after you get out. It will be difficult, but it would do you much, MUCH better to wait to find a girl until after you are out of the service. With all the crap going on I wouldn’t touch a female in the military if they begged me. Too many ways to get in trouble. So your son joined the marines because his girlfriend was in the marines(or joining herself)? I think joining the military is an honorable thing to do and I would be proud of any of my sons for doing it – but it needs to be because you want to serve your country, not because you were chasing tail. Maybe I am misunderstanding let me know. He joined the Marines because he wanted to, whereas I recommended he consider a trade school, but told him if he really was set on the Marines then he should do it. However, due to posts like the recent one by Dalrock I am going to recommend that he absolutely NOT get involved with any of the women who may be on base with him or have anything even remotely to do with the military. I do not have anything against the military, but wanted him to take careful consideration over what he was getting himself into before he made his decision. Suffice to say he didn’t listen to me, but its on him now. If the women pushing for PC agendas like this could get over themselves for about 2 seconds, they’d realize that they are NOT doing women a favor at all here. I feel much safer with a military full of men rather than full of women and I dread the day that these women find themselves and others (like me) getting drafted into the army because they didn’t bother to consider what “full equality” looked like. I also feel very sorry for the men in the military who find themselves needing to pull the weight of female soldiers along with their own. When the rubber hits the road, biology has a habit of winning out, and it is wrong how many lives we put in danger because we insist on embracing some false sense of equality. There is a lot of satisfaction to be gained from living the way God intends us to. I really do think if these women would set aside their need to be masculine and embrace their femininity, they would be happier for it. I think that we partly have to blame MRAs for this as well. Not the manosphere in general. Just the portion that specifically focuses on men’s right’s activism. They like to complain a lot about how women are oppressing men by not signing up for the draft and how the government is unfairly favoring women by not obliging them to sign up for the draft. They also complain about women not being willing to take on more dangerous jobs and about women of the past not having fought in wars. For a lot of them, I believe that it’s mostly a talking point designed to make feminists uncomfortable, but I don’t doubt that those complaints have pushed egalitarians on both sides to consider equalizing everything by giving men and women the same responsibilities. Now, when it comes to combat situations, you won’t do anyone any good if you can’t meet certain standards. You become a liability. I can understand why some women might feel obligated to try for combat roles out of a fear that they’re putting an unfair burden on men by not trying for those positions, but ultimately, the vast majority can provide better support by either taking on non-combat/supportive roles or just taking care of things at home. Alex, you could definitely be on to something. I really know next to nothing about the MRA. It wouldn’t surprise me to find out it was a multi-faceted problem, though.